As of the 1st April 2018, the breastfeeding peer support in North Lancashire is being delivered by a new provider. If you live in the area, please call 01254 772929 to find out more about the service. The details on this page are therefore for information only, to celebrate the great work that the North Lancashire Star Buddies project achieved between 2010 and 2018. 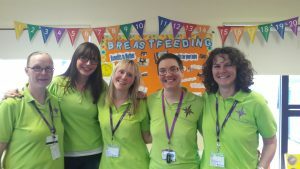 Peer supporters in North Lancashire deliver a universal peer support programme for all breastfeeding mothers and work closely with midwives, health visitors and children’s centres in the area. Bedside support is provided for all mothers living in North Lancashire who initiate breastfeeding at Royal Lancaster Infirmary or Blackpool Teaching Hospital with a shift every day of the week. Peer Supporters provide ad hoc support on the delivery suite, midwifery led unit and the paediatric ward. The community team offers 1:1 support at home for 6 weeks and beyond for all mothers who initiate breastfeeding in the North Lancashire area. This support is provided 7 days a week. Peer Supporters run breastfeeding groups where women share experiences and can talk through any issues with a trained volunteer. A Volunteer Coordinator manages a team of 50 volunteers who work in groups, in the hospital, in the community and help man the National Breastfeeding Helpline, which runs 9.30am to 9.30pm 7 days a week. Local volunteers help sign up and audit businesses for the Welcome to Breastfeed scheme (Facebook page ‘Mum’s milk on the go’). Peer Supporters support the Baby Friendly accreditation in the community alongside the Health Visiting service and the Well Being, Prevention and Early Help Team.